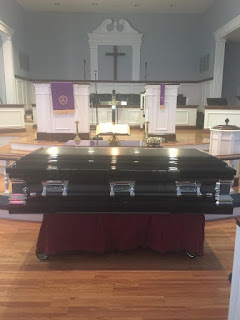 Dearly beloved, we are gathered here today for the funeral of “Old Self.” One of the core beliefs of the Christian faith is that we let our “Old Self” die. I know, it sounds sort of depressing—all this talk about death. But hold on, we’re talking about the death of things that we want to die—things that should die. We’re talking about letting sin and selfishness die. And this type of death is joyous, because it means getting rid of the very things that keep us from being truly alive. This “Old Self” steals our joy and wrecks our relationships with God and the people around us. Normally when you have a funeral, you have a eulogy. That means you praise the person’s character and recall the best of who they were. I have never been to a funeral where they said the deceased person was a lousy bum and never did any good and we’re glad to see him go. No, at most funerals they make the deceased sound like a saint (even if they weren’t). On a few occasions, I left the funeral service wondering if I accidentally slipped into a service for the wrong person. As I left I kept asking myself, “Who were they talking about? Not the person I knew!” Since this isn’t a real funeral, we can just be perfectly honest. What can we say about “Old Self?” “Old Self” wasn’t the kind of person we’re very proud of. Sure, we had some fun together. Old Self liked to have fun. In fact, he put his own selfish desire for fun ahead of God and everything else. He didn’t care who he hurt or who he disappointed as long as he made himself “happy.” We went along with him for a little while. However, the “happiness” we found with Old Self was hollow. It never lasted. It never satisfied. It was like the immature antics of adolescence; it seemed fun at the time, but now it just seems foolish. We grew up, but Old Self never did. How sad. Old Self always thought he was the center of the universe and everyone else was put here to please him. He never outgrew it. I remember one time, someone told Old Self how selfish he was being. Well, Old Self couldn’t stand for that. No sir. He retaliated with a verbal assault that would make a drill sergeant proud. Then he stormed out of the room and gave the person the cold shoulder for a week. They were only being honest and trying to help. But Old Self didn’t want to hear it. Old Self did worse things than that. One time, he betrayed his best friend in order to improve his own social standing. Another time he stole something from a store. He ruined people’s reputations and broke people’s hearts. Old Self was a reckless piece of work. Most people didn’t know it, but Old Self was a really good liar. People didn’t know, because he was so good at it. He would lie if it served his purposes. And he did it often. You never wanted to cross Old Self. He was the type who would get revenge. ‘Don’t get mad, get even’ was his motto. Forgiveness was as foreign concept to Old Self. Thankfully, Old Self never murdered anyone, but he thought about it a time or two. Jesus said, “If you hate someone, it is like committing murder in your heart.” He also said “if you look at a woman with lust you have already committed adultery in your heart.”[i] Old Self did all of these. He had a lying, murderous, adulterous heart. And if he’d had his own way, who knows what would’ve happened. I invite you to come take a final viewing of your “Old Self.” As you do, write down a bad characteristic in your life you would like to let die. Place in the box and burry it or, better yet, cremate it by burning it in a fire. Take a moment to reflect on that selfish part of you would like to die. Get Back in that Coffin! As you can see, the death of Old Self is a lot different from a normal funeral. And there’s a problem with burying poor Old Self. Old Self didn’t go willingly. You and I wanted him to go, but Old Self didn’t want to go. He was fighting right up to the end, scratching and clawing to keep from being cast out of our hearts. In fact, he still doesn’t want to go. Sometimes we can still hear him begging to come back inside our heart. The real problem with burying Old Self is he keeps trying to rise up out of the casket. It would be kind of funny if you were looking at the scene from outside. Old Self keeps trying to pop up out of the coffin, and we keep trying to push him back in—holding him down in there so he can’t get out. and restore you by the Holy Spirit to newness of life. Amen.